I’ve stressed my painting arm and have to give it a rest. 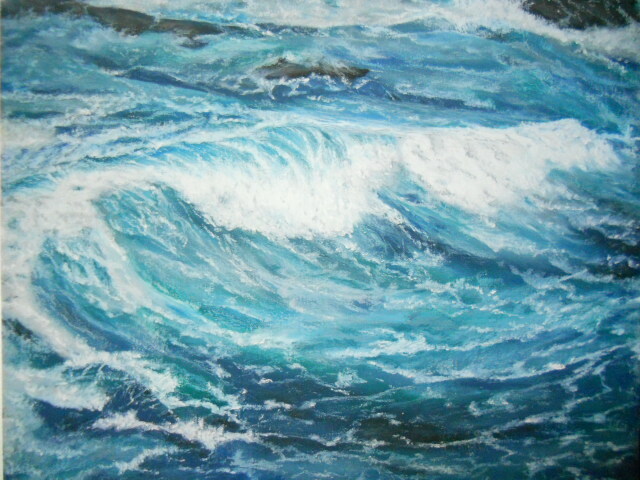 Hopefully I will be able to paint again next week. Thank you for visiting – click onto the image for a larger view. If you look long enough a quiet beauty can be found in freshly fallen snow. 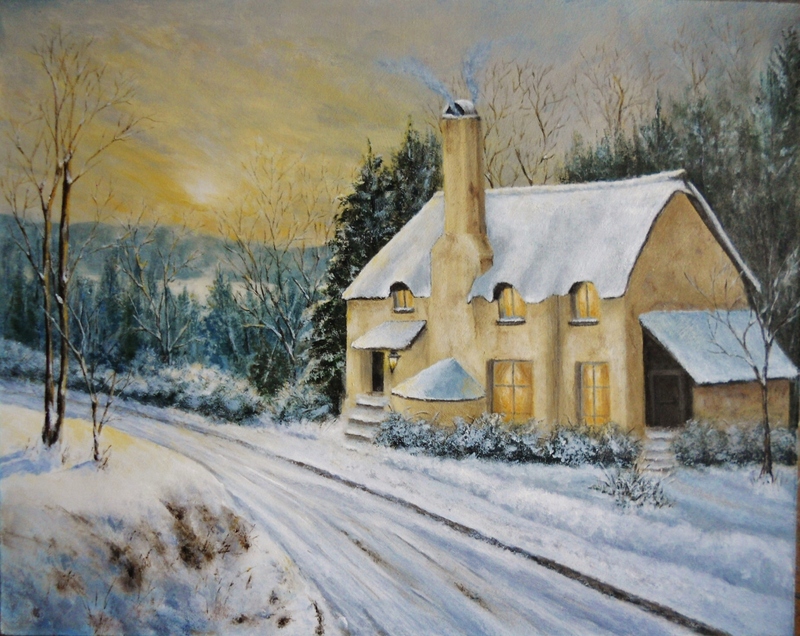 I was drawn to Andy’s quote that seemed to described the scene I was trying to convey in this painting. 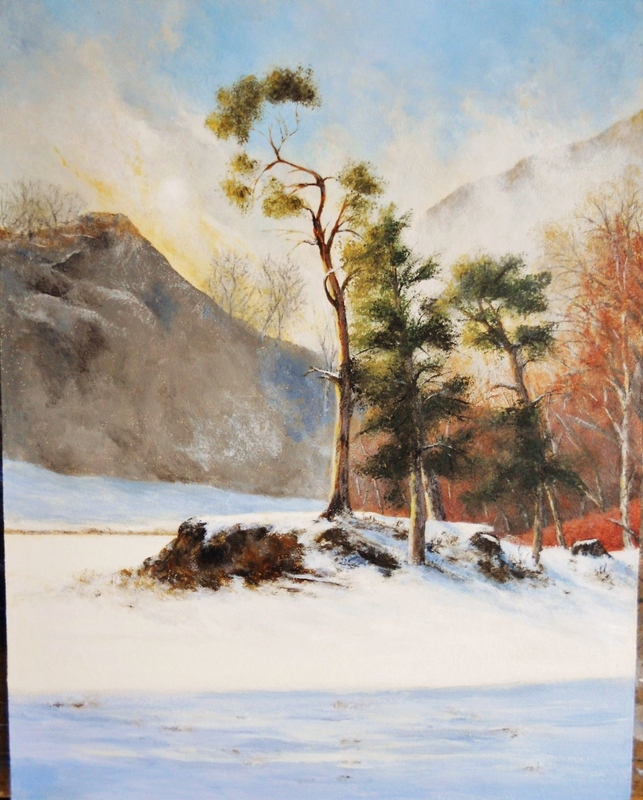 Winter Fog, an acrylic painting (14×11) was done on a gessoed hardboard using Liquitex and Golden brand paints. 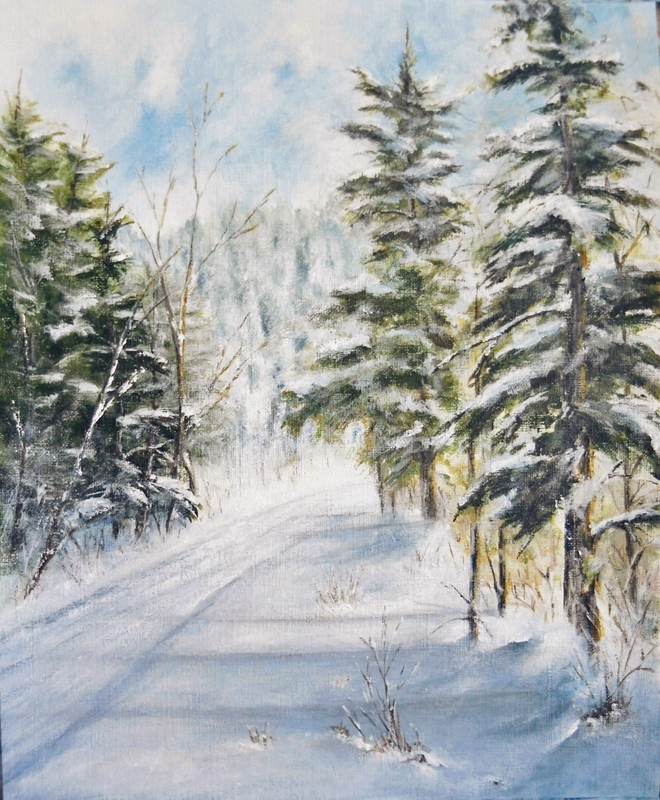 What attracted me to paint this scene was the warmth radiating from the sun soaked land, even though it’s winter – that juxtaposition between warm and cold was an interesting element to capture. 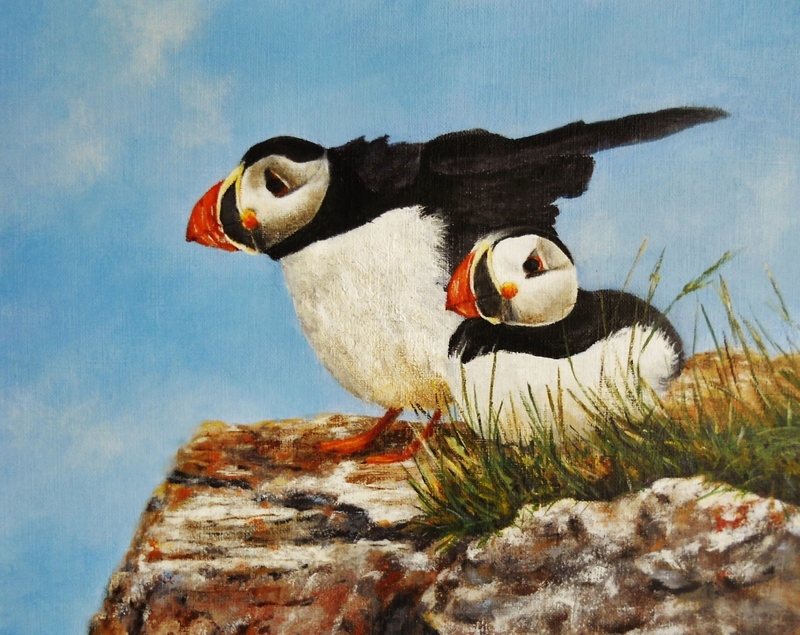 I am thinking that the scene is missing a little life, so I may go back in and add a few birds in flight. Happy Valentines Day and thank you for visiting ~ click onto the image for a larger view. 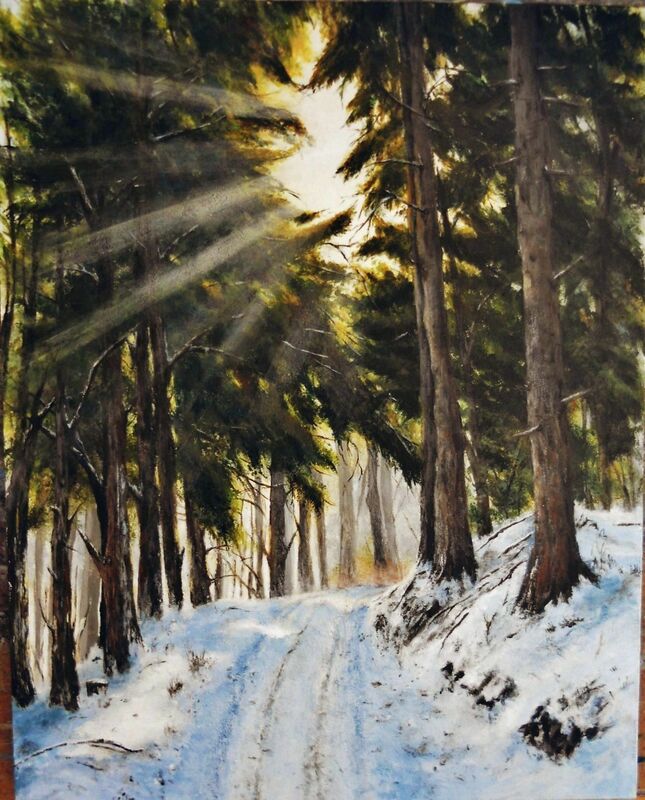 Winter 2018, acrylic (11×9) was painted on a gessoed hardboard (I love using with acrylics) using Liquitex and Golden brands. I’m continuing to learn the purposes of a variety of brushes, the techniques of layered coverage and how to get certain marks. Happy (belated) New Years to you and yours. Thanks for checking in ~ click onto the image for a larger view. A tribute to my friend who passed away from ALS. A progressive neurodegenerative disease that affects nerve cells in the brain and the spinal cord. The quote from Jonathan Livingston Seagull couldn’t be more right – live in the here and now – you never know what tomorrow brings. 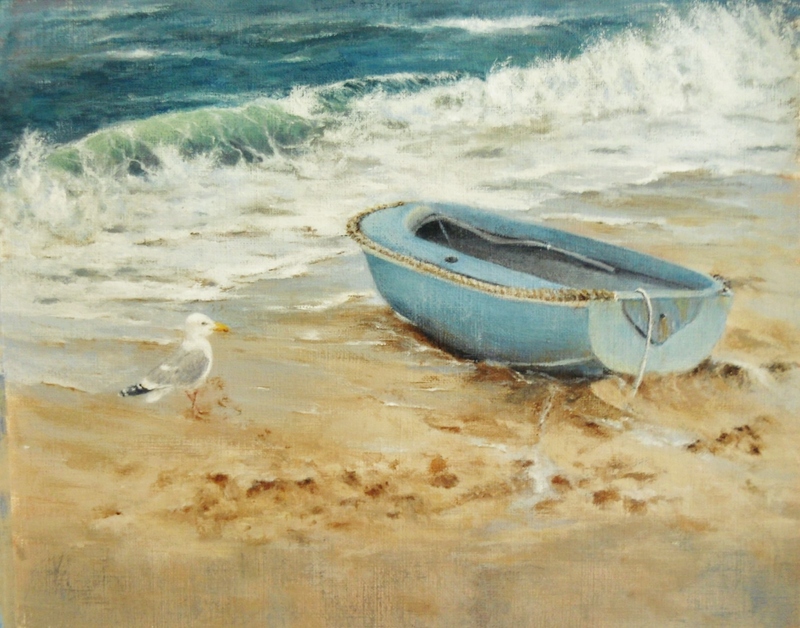 A Seagull and The Boat is an acrylic painting (8×10) done on canvas paper – it was painted using mainly Liquitex and Golden brands. This painting was the final piece I did for an upcoming auction being held in FL. I was pleased that they accepted it and is my hope that it goes home with a lucky bidder and the organization reaches their goal in raising money that will go toward caring for women and children. Thank you for visiting ~ click onto the image for a larger view. 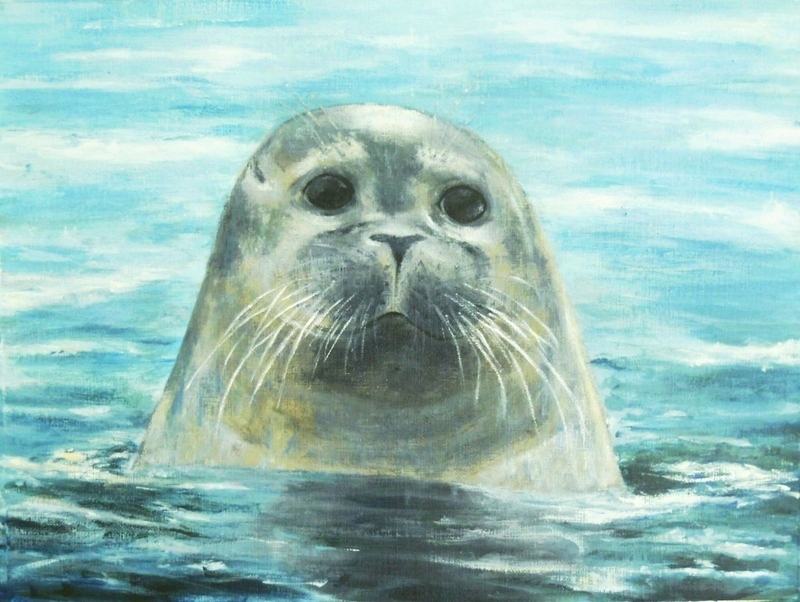 Seal Pup, an acrylic painting (9×12), was painted on canvas paper using mainly Liquitex and Golden brand acrylics. Who would have thought I’d be painting a Seal, it’s so completely different from my norm, but originally this painting was created for a mother’s/children’s benefit auction. It was fun piece to try and capture this little one. I fell in love with this Seal, she was sweet as could be. Thank you for visiting ~ click on the image for a larger view. That includes me . . . I can’t resist. There is something very beautiful about waterlily’s and ponds, a tranquil sense of being comes over me when I look at them. Whether the scene is drenched in sunlight or it’s a rainy day, the sight of these delicate flowers is always calm and welcoming. 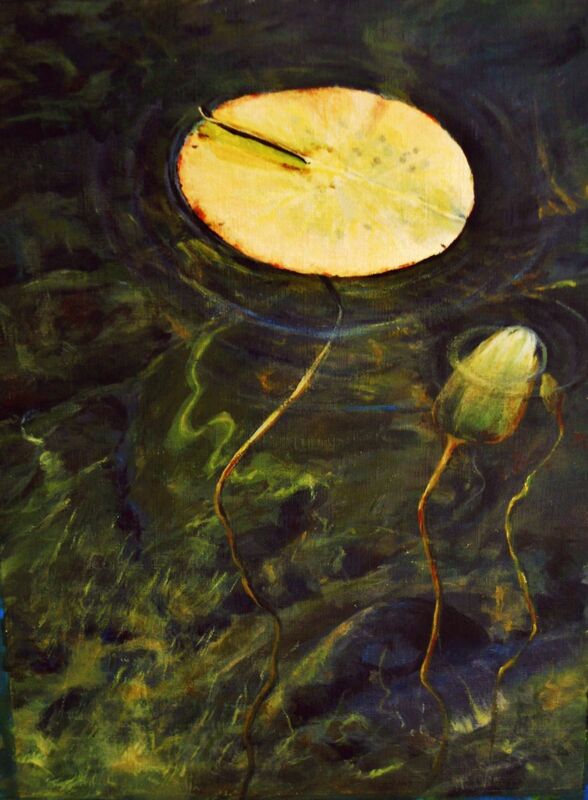 Yellow Waterlily, an acrylic painting (11×9) was done on Canson canvas paper using Liquitex and Atelier brands. I’ve always wanted to try my hand at painting a waterlily and transparent water. I wanted the waterlily to be the star in this production, so the challenge for me was in keeping the background muted, lessen any intensity of color, little if any hard edges, and then to develop some waviness to the images beneath the water. I enjoyed painting this scene ~ thanks for checking in and visiting. Please click the image to see it in a larger size. 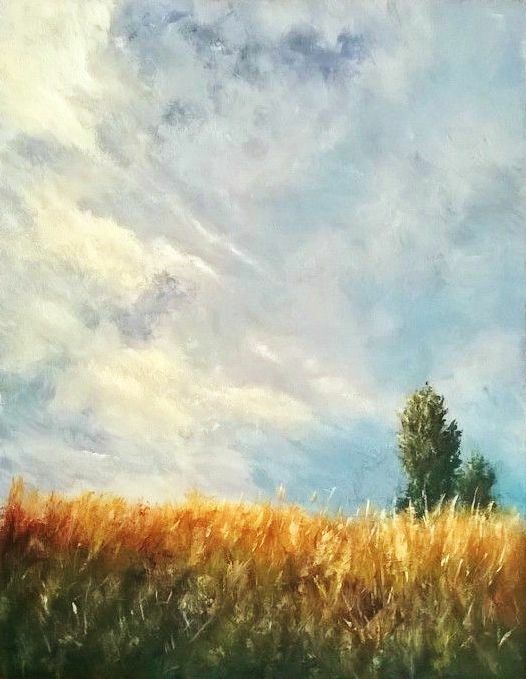 Colorado Atmosphere an acrylic (10″ x 7.5″) painting was done on a gesso prepared hardboard, using mainly Liquitex and Atelier brands. It’s been a while since I’ve used hardboard as a surface and it worked out beautifully for this painting, giving some nice textures. When I saw this scene the clouds spoke to me and I knew it was time to go after another landscape with a bit of atmosphere – not threatening, but rather a windy summer day. Thanks for visiting ~ click onto the image for a larger size. 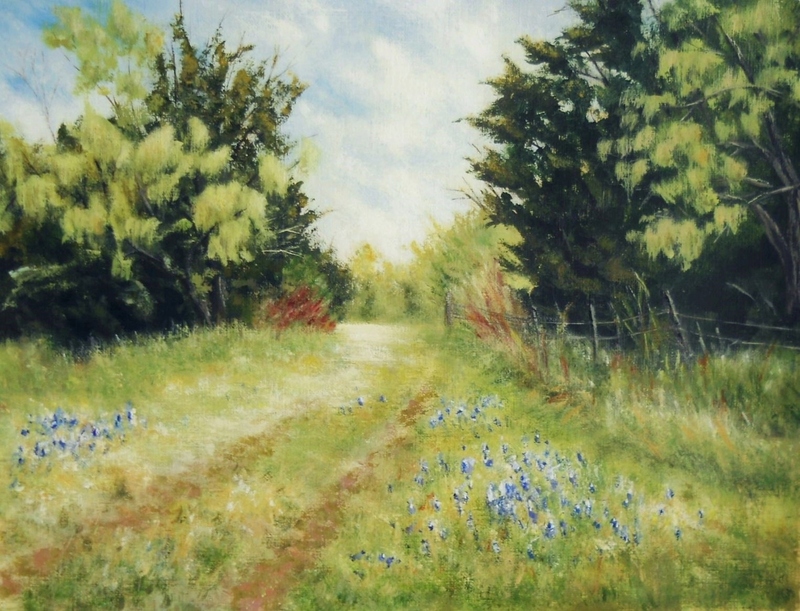 Texas Country Path, an acrylic (8×10) painting was done on canvas paper using Liquitex, Golden and Atelier brand paints. On a recent Spring ride we went to see the wildflowers and saw this quiet scene. The path was gorgeous, lined with patches of blue bonnets, everything was fresh including the budding new growth on the trees. Some probably passed right by, but this was one of those places I couldn’t help but notice, the quiet beauty of it kept calling out. Thanks for visiting ~ hope you are having a lovely Summer (it’s hot and dry in Texas).